No. 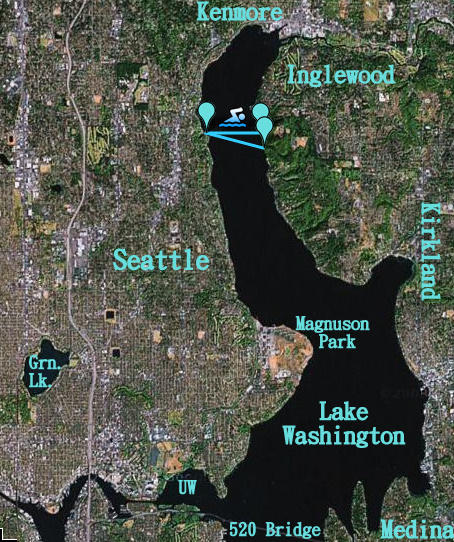 72: Swim the width of Lake Washington. Convince my dad to go with me. I've already completed the [easy] half: my dad is up to the challenge. As is Chris. And Alex. Which is great except that Alex is just about the fastest swimmer in the world and she's going to be half way across the lake by the time I've paddled 10 strokes. Readers, I need to start training RIGHT NOW. 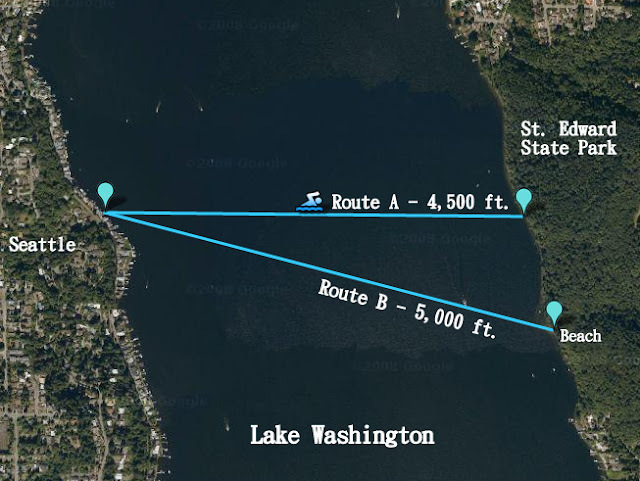 The only difference is that Route A (4,500 ft) is the shortest route across the lake to the park. Route B is slightly longer (5,000 ft) but it arrives at the sweet little beach. As you know, 1 mile = 5,280 feet so the long route is approximately 300 feet shy of that lovely milestone. Depending on how we're feeling, we could swim back out into the lake for a few hundred feet just to say that we swam a mile. Right, off to go practice my swimming. This summer when we're down for graduation! Great! I should warn you though: the water is going to be very, very cold in June! I'm going to look into renting triathlon swimsuits for us. You guys must be good swimmers! I couldn't do that. :-P Can't wait to hear about how it goes.